Twenty Cent Coins Minted Only From 1875-78. Rare Date Analysis of Oddball Coin. The Twenty Cent coin is the shortest-lived denomination of all United States coins. Business strikes were issued for only two years, 1875-1876. Twenty Cent coins were also struck in 1877-1878, but were limited to proof examples. Others argued that a twenty cent piece conformed better to the U.S. system of currency, as the government already issued notes of $1, $5, $10, $20, and $50, but no $25 bill. Critics countered the Twenty Cent coin was nothing more than a political manifestation of the silver mining industry. The photos above show the relative size of the Twenty Cent coin (left) compared to that of a quarter. The coins are fairly similar in size, and both carry the Seated Liberty theme. The Twenty Cent coin had a plain edge compared to a reeded edge on the quarter, but this did little to differentiate the two. Its not hard to understand how people easily confused the identity of the coins, which is cited as one of the primary reason the Twenty Cent coin lasted just a couple of years in regular production. Authorization for the new Twenty Cent piece was provided by the Coinage Act of March 3, 1875. Perhaps the coin might have gained a foothold in American society had it not been so easily confused with the quarter of that era. The Twenty Cent piece diameter was more than 90% that of the quarter, and both coins carried the same Seated Liberty design on the obverse. The close similarity between the two caused too many faulty business transactions. No wonder there were so many complaints from the public. More than one million Twenty Cent coins were minted in 1875. 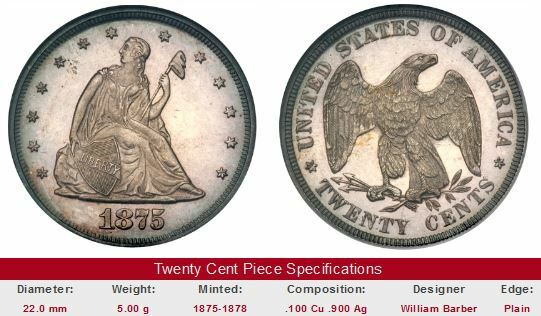 As the negative reaction intensified, the government recognized its error and scaled back production drastically in 1876, as only a combined 25,900 Twenty Cent coins were minted at the Philadelphia and Carson City Mints, and most of them were melted down. The final year of the Twenty Cent coin, 1878, saw a mintage of only 600, all of them proofs. Key Twenty cent coins are offered for sale below as eBay auction coins. The left hand side of each "Sales Box" is value trend data over a very long period of time for the coin in G-4 condition. The percent annual increase is computed for comparative purposes. The coin pictured for sale in the right hand side, if any, is not necessarily the same condition coin as that represented in the value trend analysis on left hand side.